Prevision SicBo is a game of chance played with the use of three dice. The objective is to predict the various outcomes, totals and combinations of the three dice. 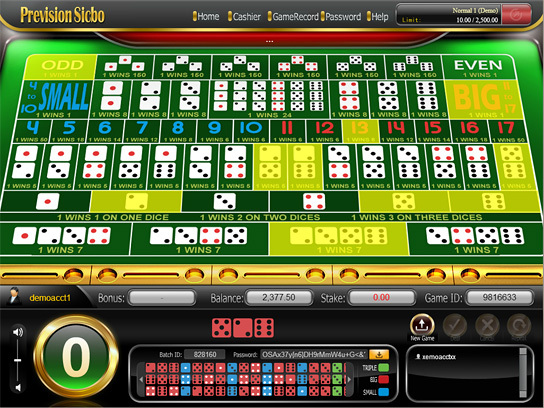 To bet on Prevision SicBo, place your chips on one or multiple designated sections. The game table is divided into several sections, each representing a different result or a combination of dice. Players must confirm their bets within the betting period, afterwards the results will be revealed on the screen. Copyright © 2015-2016 A1 Games, All Right Reserved.